Presentation on the 'St.Jame's Care for the Dying' project 2000. Care for the dying and hospice principles in hospital setting. 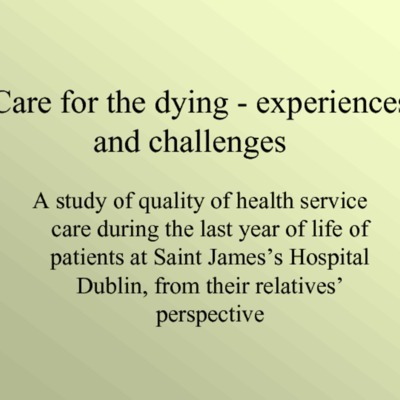 Presentation given on a study of quality of health service care during the last year of life of patients at Saint James’s Hospital Dublin, from their relatives’ perspective. Palliative Care Service, Saint James’s Hospital, Dublin. Parent Collection: Hospice Friendly Hospital programme. Orla Keegan, Hannah McGee- Health Services Researach Centre, Dept of Psychology, Royal College of Surgeons in Ireland. Therese Brady, Howard Kunin- Irish Hospice Foundation Morna Hogan, Sharon O’Brien, Liam O’Siorain- Palliative Care Service, Saint James’s Hospital, Dublin., “Presentation on the 'St.Jame's Care for the Dying' project 2000.,” Archives Hospice Foundation, accessed April 22, 2019, http://archives.hospicefoundation.ie/document/317.